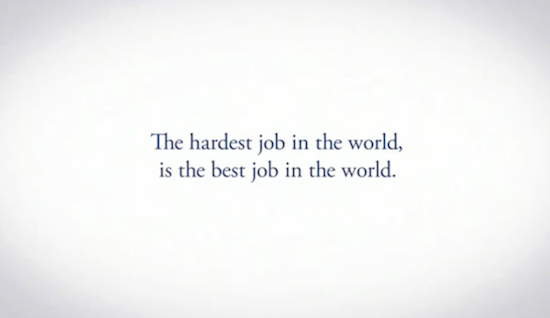 Hardest job in the world is the best...blubbering alert! My husband is always showing me ads, as we are both Marketers and met while we were working in Advertising. So he thinks in my spare time I want to spend my time watching ads. Anyway enough of the back story, it's time for to enjoy, and I use enjoy in the loosest sense. It is worth it though, it is a beautiful and likely award winning campaign. Only thing is please watch in the immediate vicinity of a full box of tissues and preferably with a sensitive partner around, if you are luckier than me and have one! Oh yeah I cried. At least it wasn't the ugly cry though.